I've been wanting to get my kids out for the night experience. Earlier opportunities this summer involved high water, and I just wasn't crazy about little kids streamside in elevated flows in the darkness. I also wanted some moon - not that I'm picky or anything, but I wanted their first trip out to be enjoyable, and I figured being able to see their surroundings would make it all the more pleasant and awe inspiring. I saw a handful of mice dart across the road in the headlights as we vibrated over the washboards in darkness to where I wanted to start. Always a good sign that the 'hatch' is on. As we got out of the truck I noticed another mouse on the gravel of the road. The kids bailed out and gave it a good chase. They had it cornered a couple times before losing it into a crevice. That seemed to set the stage for a good night of adventure and mousing. Well, it would only be a couple hours. Maybe three. It certainly wouldn't be all night. We hiked to what I figured was a decent starting point for both fishing structure and minimally hazardous waterline. 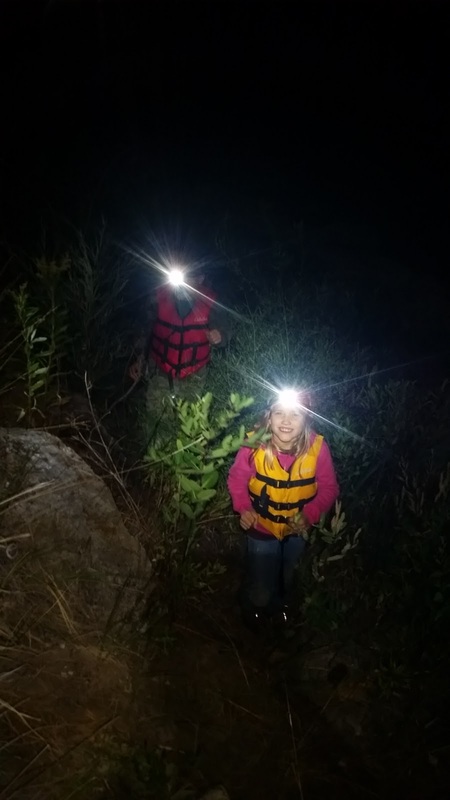 The kids experienced how well they truly can see in the ambient light of night (at least in the wide open unvegetated world that is Montana) because I had them hike with lights off. The pale dirt of the trail was easy to see, and as eyes adjusted to the dimness the texture of the ground surface could be seen. The hillsides were white in the moonlight but were still only a vague suggestion of the terrain. When we arrived at the water's edge, they both slipped a life jacket on. We'd discussed this ahead of time and they accepted my requirement without any pushback. As the night wore on we did things I never do. We shined lights everywhere. We observed bats. I knew there were a lot, but it wasn't till this night that I knew just how many filled the air. We watched them eat and flitter. We watched them react to the flying mouse fly. I pointed out the sounds of the bats and of landing waterfowl. 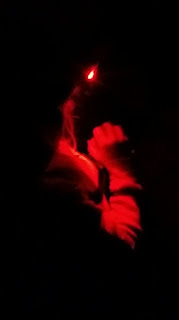 They spotlighted my mouse and watched how it came to life in the water. I was tossing one of Chris Cutler's arti-mouse creations I'd gotten from him earlier in the summer. My daughter exclaimed "It looks just like a real mouse!" We listened to real mice rustle in the bushes. They scrutinized insects. They hunted crayfish. And maybe most of all, they were fascinated with their ability to create sparks by smashing one rock into another. I had three hits, and the kids heard them all. 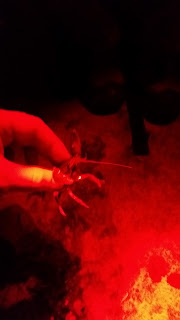 Each was quite different in volume from the occasional slurp of a bug that was happening now and again out in the unseen water. Each was a close range explosion, with the last being least dramatic. After the second miss, which had been attached for a nanosecond and resulted in some extra thrashing, my son announced that tonight wasn't my night. If he only knew how lucky we were to have done this well and it was barely midnight. I wanted to tell him I'd missed nine before finally hooking the tenth on my last trip out, but I didn't think that would boost morale. Energy was dwindling. 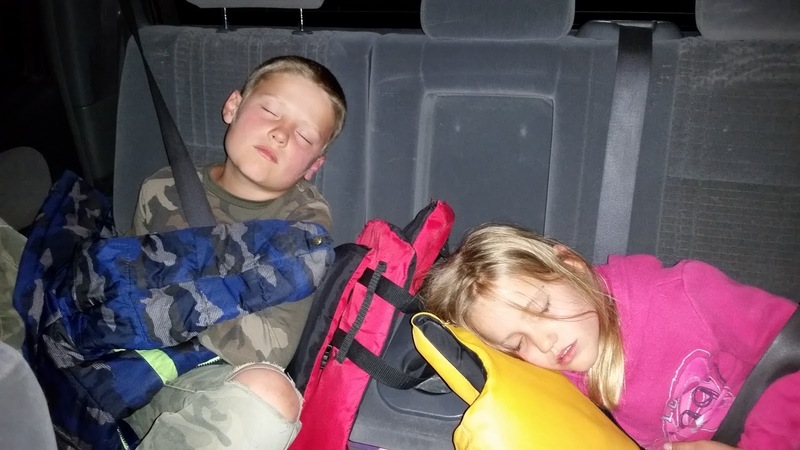 The excitement of dad taking them on a midnight hike was fading into the desire to be in bed. They needed a goal. I pointed at a tree silhouetted against the sky up ahead where we would climb out of the river bed. And doggone if I didn't connect with hit number three behind a boulder just at that exit point. All lights came on the instant I gave permission and the river was flooded with light like day as they watched the mouse-eating brown jump and run. I got a lucky break when it wrapped around a boulder and then came back. Truthfully, I'd never seen a night battle like this. I avoid light whenever possible until net time or quick progress along the bank is needed. I can say with certainty that flipping the light on prematurely in the past has resulted in an extra surge or two of fight. 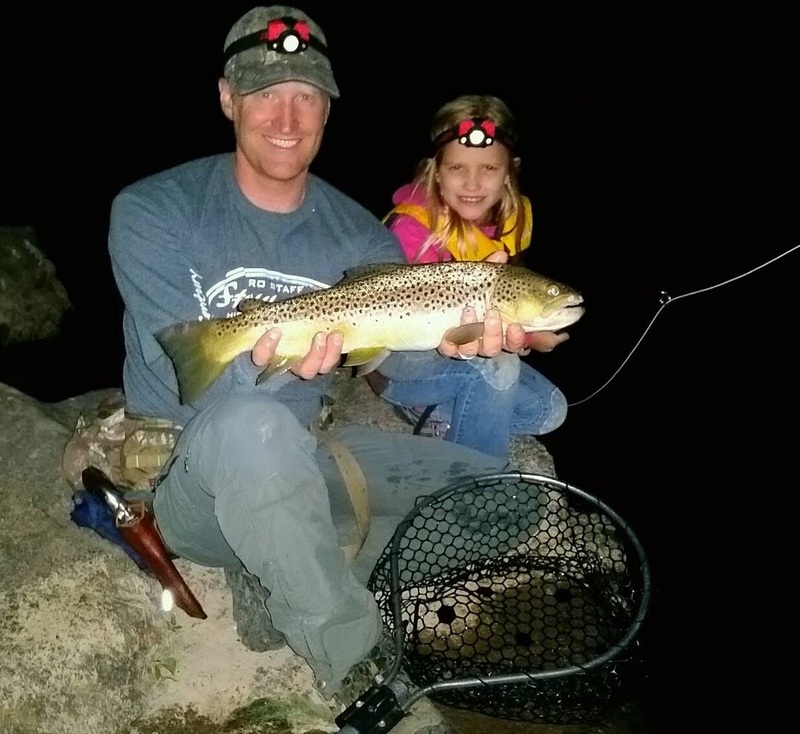 My daughter pulled the net from my pack and I passed the camera to my son. In the final second, I slid the net under the fish because my daughter couldn't reach it. We studied it, took pictures, revived it, and watched it swim off. Their headlamps stayed trained on the brown until it was out of sight. I never took another cast. Just stowed the mouse on the keeper and began our ascent from the river edge. In the truck they fought over who got head space in the middle of the back seat - but there wasn't enough energy to maintain any sibling dominace and they melted into a puddle of life jacket pillows. They were sound asleep before the truck tires made three revolutions. They've talked about the trip since. And we went out once more in the final days before school started. Our trips to the river in the middle of the night opened their eyes and dispelled whatever myths they'd found themselves believing ahead of time. My son is looking forward to the next time we go - mostly so he can bash little rocks into bigger rocks and watch the fireworks again. It just isn't as much fun in the day anymore now that he knows there are unseen sparks. Oh yeah, and maybe dad will catch another one. I love it Bryan. You're my inspiration. I really need to get my boys out to do this very same thing. :) On a side note, I have also noticed how much extra fight a fish has when it has bright lights on it. When it's dark sometimes I'm not even sure they really know they're being caught, sometimes. Ha! To think I could inspire you with regard to anything in fly fishing is humbling. Thanks! And yes, it seems that flipping on a light ignites greater fight instinct, where sometimes without light a big fish just sits or slowly cruises for a while. Sometimes.